Ever glance at your single, solitary smartphone display and wish that the information crammed on it could be spread across another screen? 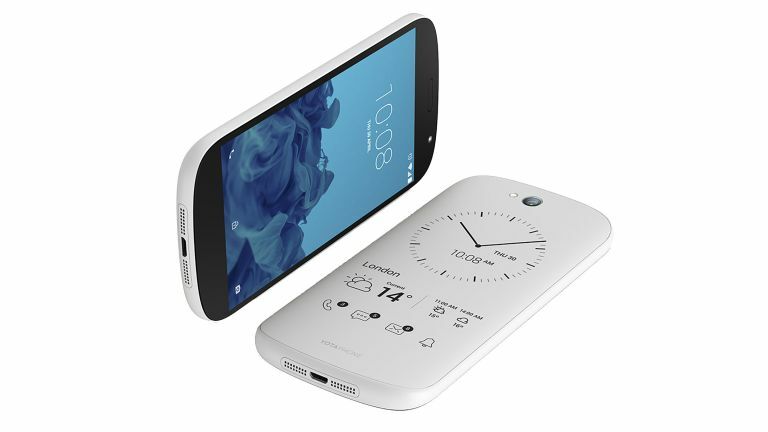 If so then the Yotaphone 2 will be for you, with a standard 5-inch screen along with an always-on 4.7-inch touchscreen e-ink display on the back, and a new update makes the unique blower better than ever. Although e-ink displays are more common on e-readers, the one on the back of the Yotaphone 2 ditches poorly written prose for notifications and icons that can tell you the time, update you on the weather forecast so you won't get caught umbrella-less in a downpour and let you know if there's an email waiting for you. If you do fancy reading a book, you can subscribe to Bookmate which has over 100,000 English ebooks so you can safely throw that library card away. The minimalist black and white design of the icons on the screen looks impressively stylish, and as e-ink is relatively light on power needs it won't drain your battery by having the extra screen. The Yotaphone 2 has been given a feature boost with a new update, bringing even more features to the handset. These include an upgrade to the Lollipop flavoured Android (Google's latest version), and improvements to the layout of the e-ink display. The previously none more black handset also gets a brand new white version and a price cut of £115, which means you can now get your hands on the Yotaphone 2 for £440. If you've got an iPhone 6 you can now give it an e-ink display with this Popslate case.